The White-fronted Amazon is the smallest of all the Amazon parrots. A.a. albifrons: Male-body green, the feathers edged dusty black; red lores and red area around eyes; white forehead and forecrown; carpal edge and primary coverts red; tail green with red at base. Bill yellow. Eye ring pale grey, eye yellow. Female-carpal edge and primary coverts green. A.a. saltuensis: Both adults body green washed with blue; blue of crown reaching to nape. A.a. nana: Both adults as in albifrons but smaller in size. As in adult female but red of lores not extending to area around eyes; white forehead and forecrown tinted with yellow. Eye pale grey. Calls loud and varied. Include squealing, barking, loud harsh notes, loud harsh trilling and short sharp calls. Fruit such as: apple, pear, orange, cactus fruits, bananas, pomegranate, etc, forming about 30 percent of the diet; vegetables such as: carrot, celery, zucchini, green beans and peas in the pod, fresh corn; green leaves such as: Swiss chard, lettuce, sowthistle, dandelion, chickweed; spray millet; small seed mix: millet, safflower, canary and small amounts of buckwheat and oats; limited dry, soaked or sprouted sunflower seeds; cooked pulses and beans, and complete kibble. Avid chewer, so provide lots of bird-safe wood toys and branches (fir, pine, elder, willow), puzzle/foraging toys, vegetable tanned leather toys, ladders, swings. Bathing, socialization. Birds are taken for the wild bird trade and hunted for food. 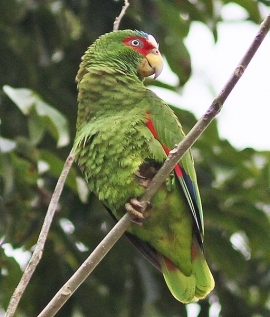 Decline may have occurred in Yucatan due to persecution of parrots feeding on cultivated fruit after loss of wild food to effects of Hurricane Gilbert. A.a. albifrons: Pacific slope of W Mexico, south from Nayarit to SW Guatemala. A.a. saltuensis: NW Mexico, in S Sonora, Sinaloa, and W Durango. A.a. nana: S Mexico, in SE Veracruz, south to NW Costa Rica. Found in a variety of wooded areas and open country with trees such as moist, seasonal semi-evergreen and deciduous forest, pine woodlands, gallery forest, ranchland with stands of open woodland, savanna and arid tropical scrub with cacti. Up to 1850m (6068 ft). Eats seed pods, fruits, cacti, buds; also cultivated crops such as mango and maize. Birds vocal and excited while feeding. In pairs when breeding but sociable, occurring mostly in small flocks. Some communal roosts are reported to contain several thousand birds. 3 or 4 rounded eggs, 30.0 x 22.5mm (1.2 x 0.9 in).